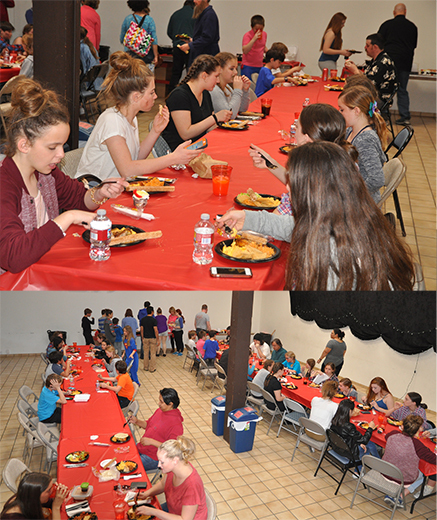 The High Street Arts Center cast and crew for the current production of “Oliver” were treated to supper between the matinee and evening performance last Saturday, February 20th – one of three, two-show Saturdays during the run. Michael and Laurel Marion, and Hugh Riley of the MFA Board were hosts for the supper featuring roast chicken, enchiladas, beans and rice, at Studio 61 next to the Arts Center. Dinners are regularly provided for each of the two-performance Saturdays to give the cast a chance to relax, enjoy a little camaraderie and put away a good square meal as they prepare for the evening performance. The next two Saturdays will be hosted by Kelli Hays and Linda Goble on February 27th, and The Babb Family on March 5th.